Linda Ames is the owner of the online store, Vintage Textile, which specializes in exquisite antique and vintage clothing and wearable designer fashion from 1750-1980. Here she describes the nuts and bolts of storing your valuable collection. 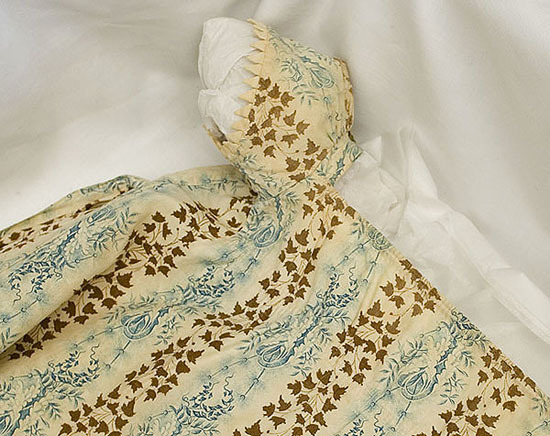 These recommendations are a compendium of expert opinion on the subject of storing antique textiles, especially an article titled Care of Historic Costume and Textiles at the web site of Kent State University Museum. For more detailed information on this topic, I recommend you explore this fine resource. The quotes in this article are from the above article. The recommendations reflect optimal practice for storage. If you can do 80% of what is recommended, that is a great achievement and should go a long way to preserving your treasures long term. Even if you can do only some of the best practices, that is still better than nothing; you will reap some of the benefits of your care and effort. Do not be discouraged if you cannot do it all! For additional information on the care of vintage clothing, see the article on "Quality and Condition." A careful written record (“collection journal”) of all textile purchases should be kept detailing the item’s name, a brief description, date of purchase, and vendor. Additional information supplied by the vendor or obtained by you should be added to the description, especially information on provenance. The collection journal will be used for insurance and estate purposes. In this article, I use the generic term “textile” to include clothing (“costume”), any valuable cloth or fabric, tapestry, rugs, and lace. 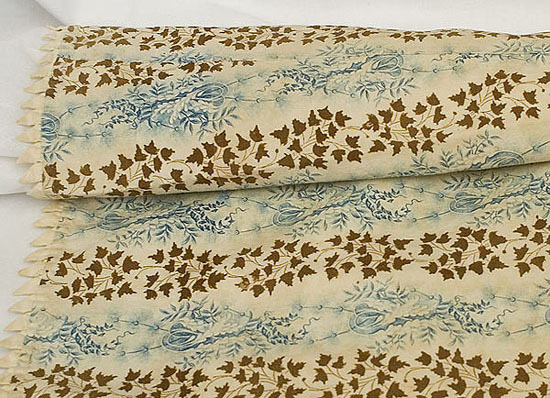 Archival storage is commercially available for textiles. Because it is quite expensive, it may be justified only for very valuable items. Since you will presumably be storing your vintage collection at home, you will need to follow certain principles to maintain them in good condition over time. Before storing, make sure that clothing is as clean as possible. If the garments have a musty smell, air them indoors away from direct sunlight. To remove dust, first protect the surface with a piece of nylon mesh, and then vacuum at low speed, holding the vacuum attachment just above the textile. Cotton can generally be washed or dry cleaned, if necessary, and then stored without fearing deterioration. Linen can be washed and dry cleaned. Wool needs some moisture in the air; but avoid exposure to sunlight. For silk, avoid heat and dry conditions. Weighted silk should not be washed. Most man-made fibers are washable and some can be dry cleaned. On the labels, you should find instructions which advise on cleaning. Follow them carefully. The greatest danger to all textiles is light, both artificial and ultraviolet (daylight). Over time, light causes fading in the colors of the fibers, eventually damaging the fibers themselves. Other enemies of textiles are dirt, dampness, insects, and excessive heat. Remove a stain if you can do it safely. When in doubt, consult a clothing conservator. The general rule to follow: do not make changes to a garment unless necessary to make it safe. 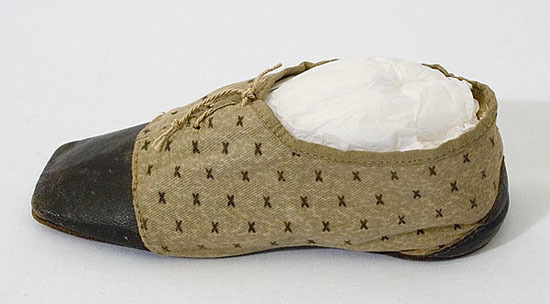 The 19th century child's shoe below already had folds from wear near the heels. Extra padding may smooth out the folds, but the fabric should never be forced. For long-term storage, find a space that is dry and dark with a cool, even temperature. The air should be clean with good circulation. “This usually means an interior wall in the living area of your home, rather than the basement or attic.” Keep on hand plenty of acid-free tissue paper (tissue) for packing. “Buffered acid-free paper remains acid-free for a longer period and is used for cotton and linens. 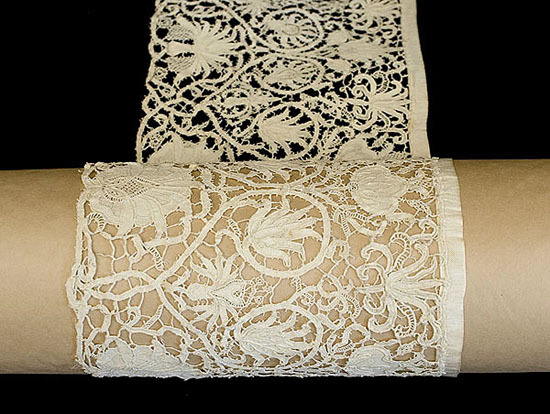 Unbuffered acid-free paper is used for silks and woolens.” The 17th century punto in aria lace below is rolled on acid-free tissue to prevent creases. When Vintage Textile ships your garment, outside the wrapped tissue we use a protective covering of plastic, which protects against moisture in case the box gets wet during shipping. During shipment (a couple of days), the garment will not be harmed by the plastic covering. But it should not be used for long-storage because antique fabric needs to breath. If the garment is quite sturdy at the shoulder area, it may be stored on a padded hanger with a fabric cover. Plain cotton muslin or a 100% cotton sheet can be used. If new, wash the fabric to remove the chemical finish. The garment should be set on the hanger without putting strain on the shoulders, collar, or sleeves. Use plenty of tissue in the sleeves, bodices, and upper parts of the skirt. Try to remove creases and folds. Consider placing very valuable garments on their own dress forms covered with clean fabric closed at the top and open at the bottom. For horizontal storage, use boxes made of acid-free materials. 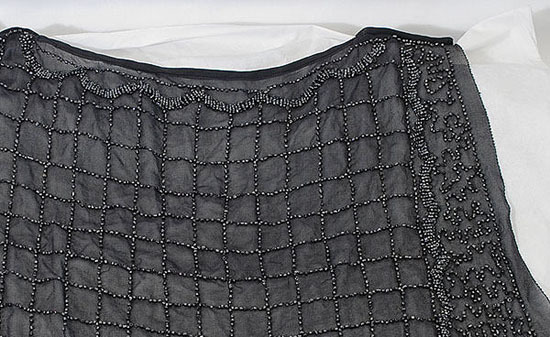 Dresses with sheer or lacy fabrics; heavily embroidered or beaded dresses; dresses with bias-cut sections or with trains; and heavy skirts—all should be stored horizontally. Smaller, lighter items may be stored, unfolded, on top of each other. Take care that the total weight on the bottom layer in the box is not excessive. Sharp surfaces on a garment must be padded. The 1920s beaded chiffon dress below has multiple layers of tissue sandwiched between the front and back layers to protect the fabric from bead imprints. Line the box with undyed, washed cotton muslin so that it surrounds the clothing. Place the garment in the box to minimize folds and avoid sharp creases. You may use cardboard to support certain textiles. In this case, use tissue to insulate the textiles from cardboard. 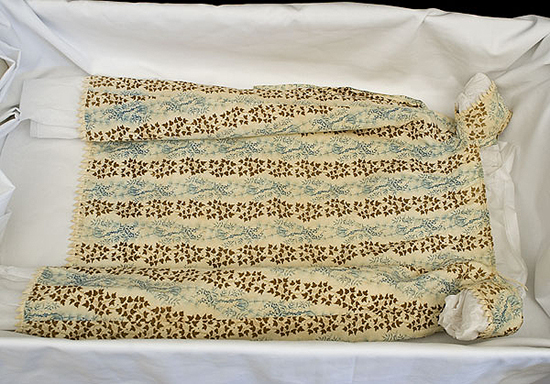 When folding larger garments to fit into the boxes, make the folds loose with tissue between the folds—see the early 19th century child's cotton dress below. Since fabrics need some air circulation, do not seal the boxes. Once a year, open the storage boxes, unfold the textiles, and then refold them differently before storing again. Use this opportunity to check for moth damage. Cleanliness is the best protection against moths, since chemicals can be harmful to textiles. By following these guidelines, or at least the most important ones, you will be going a long way to preserving your precious treasures. Copyright © 2007, Linda Ames. All rights reserved. VINTAGE TEXTILE features exquisite vintage and antique clothing dating from 1750 to 1980. Since 1998 exclusively on the internet, Vintage Textile has offered a wide selection of the best high-style clothing in all the major categories: Early, Victorian, Edwardian, 1920s, 1930s-1950s, 20th century Designer, Shawls/Textiles. They are proud to count major collectors and museums worldwide among their valued customers. To catalog an antique and vintage clothing collection, it is important to find data base software in which you can create customizable categories because it is not probable that any collecting data base software will have a template with listings for hats, shoes, purses or parasols. Moreover, a free trial download will help you sort through the data base programs available in order to select the software best for not only your vintage collection but your computer skill set.